Why stay up late losing sleep over how you’re going to earn more money when you could be making money in your sleep instead? 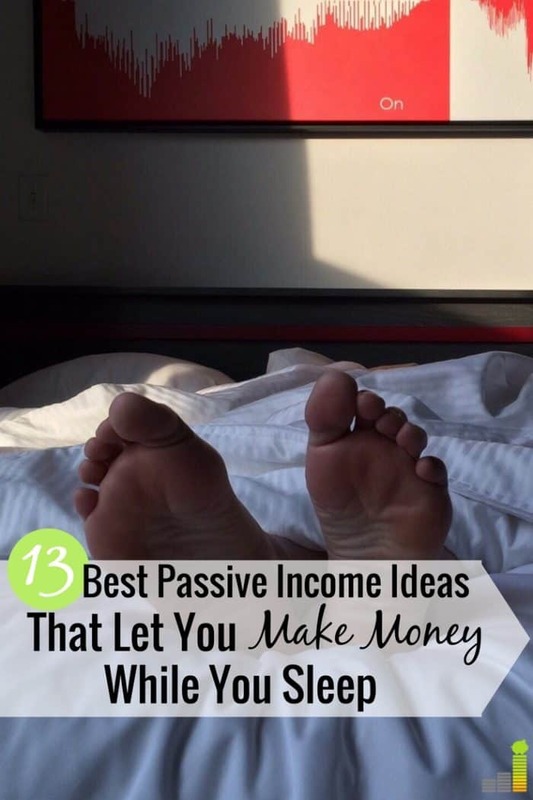 This list of passive income ideas can be life-changing by making you extra money while you’re traveling, out to lunch with a friend, watching Netflix with your family or even in your bed asleep. If you want to diversify your income and stress less about money, these great passive income ideas are a perfect place to start. Before you start thinking about how great it will feel to wake up to payment notifications and money in your bank account, you must understand that these passive income ideas take time and effort to build. Sometimes, you may need to make an upfront investment with a specific strategy in mind. It all depends on what your goals are but as you fall in love with these passive income ideas, realize that they all require work setting up a system and getting them going. Here are 13 passive income ideas that will help you make money while you sleep. When you invest in dividend paying stocks, you become a stakeholder and receive a share of the profits. This is a popular way to earn passive income because many dividend paying stocks pay out on a quarterly basis. This can a great strategy to earn passive income during your retirement years. You don’t have to wait until retirement though if you have enough funds to build a dividend-based portfolio. You will need to use an online broker to create a stream of dividend income. Ally Invest is a great option as they have many tools to help with your investing and have the lowest trade price in the industry – as low as $3.95 per trade. Real estate crowdfunding allows you to invest in real estate by putting your money into a pool with other investors. To do this, you can make equity investments in commercial or residential properties. In exchange for the funding, investors receive an equity stake in the property and returns are provided in the form of shares of the rental income that is generated. This passive income idea lets you start investing in real estate with Peerstreet for as little as $1,000 when you open a new account. This great passive income idea is something I’ve been considering. Thanks to sites like Airbnb, almost anyone can rent out their home or a spare bedroom to travelers in order to make extra money. The key to making this great passive income idea work for you is having a blog. You can start a blog with Bluehost for $2.95 per month and they install your site in one-click, letting you start your passive income strategy right away. The most unexpected passive income idea is to pay off your debt faster. Yes, you’ll be spending money to do this but you’ll actually be saving money as well, especially when you consider how much money you have to pay in interest each month. For example, I made my last student loan payment last month. Technically, I’m supposed to be paying on my student loans for another seven years if I were to stick with minimum payments but I started increasing my payments to get rid of the debt quickly. Now that I no longer have that debt, I’ve saved myself thousands of dollars over the next seven years. That’s money that can go back into my pocket or be used for other things. You can accomplish the same thing by lowering your rate. Lenders like Avant help you slash your rates by half, or more, letting you pay off debt quicker. Peer-to-peer lending sites like LendingClub allow you to loan money to others and collect interest as they pay back the loan. In fact, many P2P lenders allow you to earn 6-10% return on your investment. This awesome passive income idea works by letting you take on the role of a bank through a secure peer lending platform and can earn a higher return on your money than you would through a traditional savings account. Are there any products you can sell online? Consider selling wholesale items on ecommerce sites like Shopify. You can also try creating something. If you make printables, try selling them on Etsy or sell T-shirts on TeeSpring or Amazon. Once you get the general concept down and create a few items, you can sell them consistently with little effort on your end. Do you have an eye for a deal? You can sell those items through Amazon FBA and make money while you sleep with this passive income idea. The Selling Family offers free online courses to help you get started launching your own Amazon FBA store. Okay, a savings account doesn’t sound like one of the best passive income ideas but it does work. The cash in your savings account earns interest, building your savings while you sleep. You start with as little as you want. The trick is to find a bank that pays a decent interest rate on the money in your savings account. Barclays Savings lets you start with no minimum balance and pays at least 1.30%. You can use the savings and interest for an emergency fund or some other need. Are you good at taking photos? You can earn passive income by selling your images online to Deposit Photos. You’ll get paid every time someone downloads your photo. To really maximize this passive stream of income, take pictures of people, places and things that are commonly searched so your images can get more downloads. Looking for a great passive income idea? Look no further than pet sitting. Yes, it does require some activity in caring for the pet, however much of it is passive, while you sleep or doing something else around the house – especially if you’re watching the person’s house while they’re on vacation. You can set up a profile on Care.com allowing prospective clients to view your profile, read your reviews and decide whether or not they’d like to hire you. You don’t have to be a huge YouTuber to earn money from the platform these days. Video content has become extremely popular and lots of people are starting up their own channels to their quality content. Making YouTube videos requires a lot of upfront work as you develop your system for a potentially passive income stream. You need to come up with the content, invest in certain tools and either edit the videos yourself or hire someone to do it. It would be wise to create some evergreen video content that you can use to drive traffic to your channel so you can earn money from Google Adsense for YouTube. Next to passive income is getting paid for something you already do. Take searching the internet for example. You can use Inbox Dollars as a search engine and get paid for your searches. They also pay you for surveys or playing games. You can do the same thing with Swagbucks and they also give you cash back when you use their shopping portal to make purchases at hundreds of online stores. If you have a blog or niche website, a great passive income idea is to make money from display advertising on your site once you start to build traffic. I’d recommend having at least 10,000 page views per month in order to start seeing some consistent income, but the more page views you have, the more passive income you can generate. You can use ad networks or 3rd party advertisers and either receive a flat fee each month (if someone chooses to rent out ad space on your site) or you can be paid on a cost-per-click or cost-per-impression payment structure. The most common ad network is Google Adsense and anyone can join. However, you won’t receive your payment until it reaches $100, which could take a while depending on your traffic. Consider other ad networks like Mediavine or Media.net or even niche-specific networks with better compensation rates. What are your passive income ideas? Are there any good ones we missed? Have you ever tried any of these things in order to earn money in your sleep? The post 13 Passive Income Ideas That Let You Make Money While You Sleep appeared first on Frugal Rules.